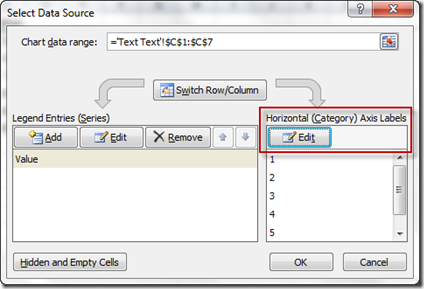 Home Chart Fixing Your Excel Chart When the Multi-Level Category Label Option is Missing. 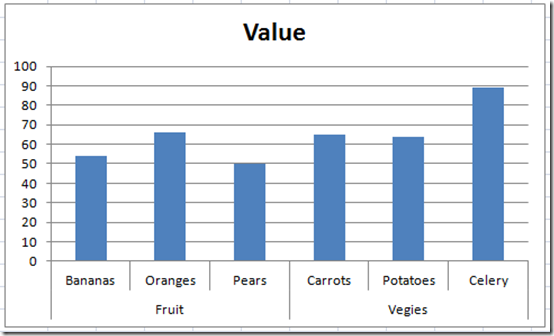 Fixing Your Excel Chart When the Multi-Level Category Label Option is Missing. 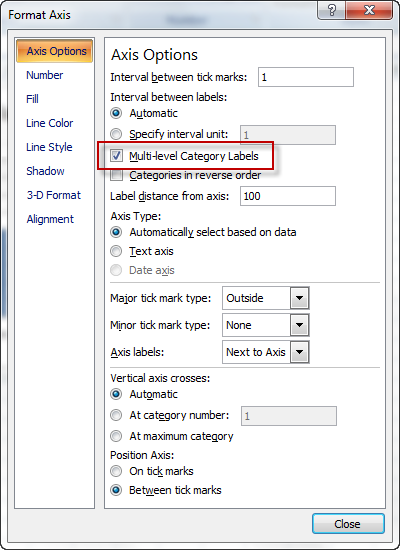 “Hi, I would like to know whether the Multi-Level Category Labels are available for the Mac 2011 version of Excel. Notice that the Multi-level Category Label check box was no longer an option. Based on his description, I determined that the problem was that he wasn’t using text for both the Main Category and Sub-Categories. But as you will see in the video and the tutorial below, you won’t have to use just text. Check it out below. I created a chart in Excel and can’t find the Multi-Level Category Label Option. Why is it Missing and how do I get it back? I believe that the issue is that the user had numbers in their sub-category. But lets test out each combination and see what we get. If we put text in both the main and sub-categories, it works perfectly. 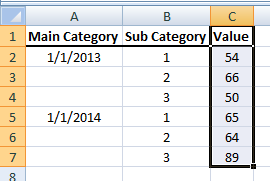 What Excel is doing is that it thinks the sub-category is just another series. This is not a deal killer as you can stub in text instead of the numbers and then after you make your chart, just copy and paste the number data back into the chart and problem easily solved. Number Number doesn’t work either as Excel thinks all three columns are data series and not category labels. Like above, this is not a deal killer if you stub in text data instead of the numbers, then create your chart and then copy/paste the original dates or numbers back into your data series. As you can see here, I am creating a chart with text in the main and sub-categories. 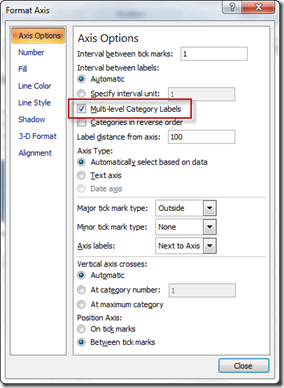 This is the REAL KEY to using Multi-Level Category Labels in Excel Charts. The trick is to always make sure that the column of data next to the first data series should be text. If you do that, then when you highlight the data series and insert a chart, Excel will do it all for you. 5) Bonus time – An alternate way yet again! So if you don’t want to fake your data and copy/paste like I describe above, here is the better way to make your chart using your original data set. 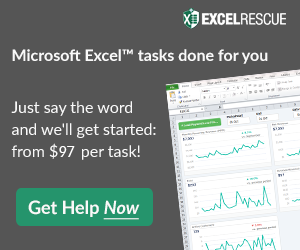 It is almost like the Excel 2003 wizard. 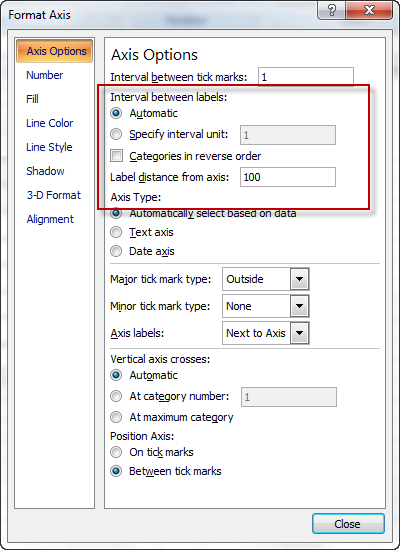 c) Select the Chart and go to the Design Ribbon and press the Select Data button. 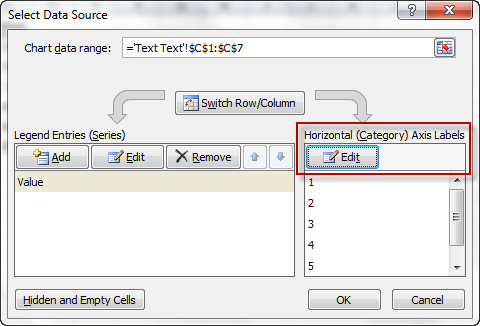 And from the Select Data Source dialog box, press the Horizontal (Category) Axis Labels “Edit” button. Then highlight Main Category and and Sub-Category labels, like this. sometimes you have to take the reigns. 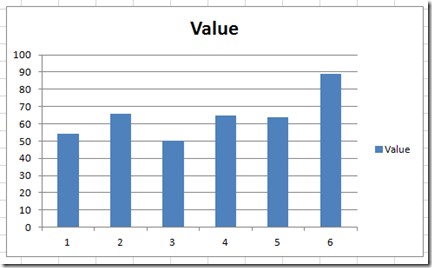 Next articleFriday Challenge – Which Chart is suitable? There is another way of fixing a chart with Multi-Level Category Labels: Delete the column headers from the Main Category and Sub Category and then re-chart the data. 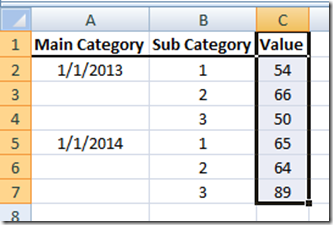 It appears that the column header is causing Excel to confuse the label data for series data. Can this multi-level organisation be replicated within the Legend? So if the y-axis is a proportion (i.e. 0 – 1) and the x-axis is a time variable such as age, then what I want to be able to do is draw a graph that permits the comparison of ten groups within the same graph. However, five of the groups are Male and five are Female, so I would ideally like to have the Legend reflect that without haveing to engage in redundant labelling. I am not sure exactly what you mean. You can delete any extra legend entries. Just select your chart, select the legend and then select the legend entry to delete. Then press your delete key. I was trying to use this option for time data. I had one column for the date and another for time. It worked properly up to a point: I couldn’t select the time intervals. As a result instead of, say, every 6 hours, it chose 6 hours and 50 minutes. Ugly! I tried changing both the “interval between tick marks” and “interval between labels”. Neither seemed to have effect. Hi Gerald, I don’t think you can mix Multi-level Category Labels and Time Series. 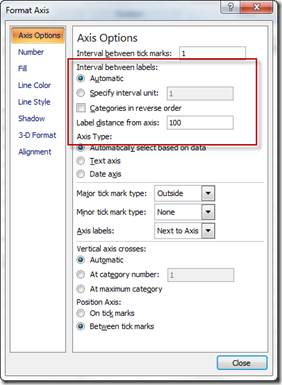 Once you go Multi-Level, you are grouping in a text type format, not time based. Good luck. Is it possible to nest another level into this? For example say you were looking at sales in 2016 vs 2015 for each of those items. 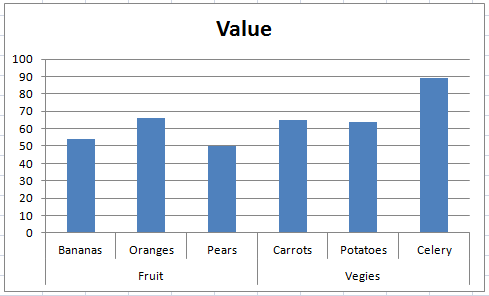 Could you do Category (Fruit/Veggie), Product (Orange, Bananna, etc) and then two columns within each of those (2015 and 2016)? Hi Ishan, you can nest other levels. I am not sure the limit, but it will get unreadable after too many levels.